Eurodollar started new correction; the first target for bulls is at level of 38.2%. If later price rebounds from it, market may start new descending movement and break minimum. At H1 chart, pair rebounded from lower fibo-levels right inside temporary fibo-zone. I closed all my orders earlier and right now is out of the market. Later I’m planning to open several buy orders. Franc reached its target and rebounded from it. Main target of current correction is at level of 38.2%. If price breaks this level, market will start new and deeper descending movement. 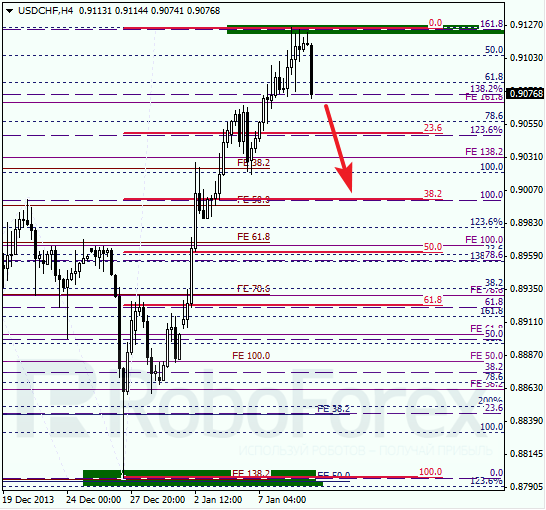 At H1 chart we can see, that market from upper fibo-levels right inside temporary fibo-zone. Take Profits on my buy orders worked. During correction, I’ll try to find good opportunity to open several short-term sell orders.